Goal: Determine which of the three pieces (A, B, or C) needs to be placed on the bottom to create a checkerboard pattern. Solution: Sheet B goes on the bottom to make the checkerboard pattern. Goal: Reveal where you would need to cut the board to make it into two shapes that would form a square, without rotating or flipping either piece. Solution: This one is a lot tricker than the first time around. Interestingly enough, you need to make two cuts even though you’re only separating the board into two pieces. First, cut horizontally along the bottom of the piece to the far right, on the second row from the top. (The piece just to the right of the hole in the board.) Then, move one square over and cut down one square, right two squares, and down one. This will separate the board into two pieces that form a square. Your solution should look like the image on the right. Goal: Stack the ingredients to make the sandwich in the order given by the clues. Solution: From the bottom up, the ingredients are cheese, egg, tomato, lettuce, and ham. Goal: Place the six people in a seating arrangement that fulfills each of their picky demands. Solution: The front row, from left to right, should read A, D, E. The back row, from left to right, should read B, C, F.
Goal: Determine the fewest number of the five stamps given you could use to create a valid equation in the space, and then identify which stamps would need to be used. Solution: This wouldn’t be a Professor Layton walkthrough if you didn’t have to remember that a 6 can be flipped upside down to make a 9. To make the equation 3+3+3=9 would only require 2 stamps, so the only stamps you need are the 3 and the 6. Check those to solve this puzzle. Goal: Identify which plates with backwards numbers can’t be rotated some amount to still be perfectly usable. Solution: 0, 1, and 8 don’t even have to be flipped to be usable; those are the same backwards as forwards. Look closely at the images. The 2 and 5 in the font this game uses are exact replicas of each other, flipped backwards and upside-down, so those can be rotated 180 degrees and be perfectly functional. The 4 and 7 are also oddly symmetrical shapes in this font, and can each be rotated 90 degrees counter-clockwise to be perfect. The 6 and 9, which are normally identical but upside down, are made unusable by being flipped backwards. The 6 and 9 are the only two plates that can’t still be used. Goal: Rotate the maze clockwise or counter-clockwise repeatedly to get the blue and red blocks to fall into the blue and red spaces, respectively. Solution: Rotate the maze clockwise five times to solve. Goal: Move each frog to the pole of the same color. Move the red frog to the right, into the center pole. Then, leap the green frog left, onto the blue pole. Leap the blue frog one space left onto the yellow pole. Now, move the red frog right onto the red pole. Jump the yellow frog to the right onto the center pole. Move the green frog left onto the green pole. Leap the blue frog left onto the blue pole. Finally, jump the yellow frog right onto the yellow pole. Goal: Divide the plot into four pieces, each containing one house, that are each the same shape, six squares in size, and each touch the well in the center square without including it. Then choose which house (A, B, C, or D), using these parameters, will end up owning the square of land with the star on it. Solution: The plots of land are each shaped like a capital letter T. The plot for A is a T rotated 90 degrees, counterclockwise, B is an upright T, C is rotated 90 degrees clockwise, and D is rotated 180 degrees. The plot that, using these parameters, contains the star, is A. The solution is A. Goal: Change the pieces of pipe from straight segments to curved ones to create a tunnel from the beginning to the end, using every piece. First, click on the first segment from the entrance to change it to a 90 degree piece, which will be facing to the right by default, so you can leave it as is, turning into the first green piece. The green pieces are set and place and can not be changed. Down from that green piece, click on the next pipe to change it to a 90 degree piece, and then rotate the tile to face the piece 90 degrees to the left. Click on the next segment to curve it and rotate it so it’s turning downwards. Click on the next square to curve it 90 degrees to the right, into the second green piece. Click on the next piece and rotate it 90 degrees to the left. Then, click on the next segment and rotate it downwards into the third green piece. Rotate the next pipe so it’s facing straight to the right. Curve the next piece upwards into the next green square. Then, curve the next segment downwards. The next piece after that should turn to the right. Next, curve the square after that upwards into the fifth green square. Curve the piece above that to the left. The next pipe should be a straight segment to the left. Curve the piece after that up into another green piece. Curve the next pipe downwards into the last green square. After that, curve the next segment upwards. Finally, the last segment you can leave as is, pointing straight up to the exit. Your solution should look like the image to the right. Goal: Just like the last leapfrog puzzle, get each frog to its matching-colored pole. First, leap the red frog to the left onto the center pole. Then, jump the yellow frog to the left onto the white pole. Move the white frog to the right onto the red pole. Next, move the red frog right onto the black pole. Jump the black frog right onto the center pole. Next, leap the green frog left onto the green pole. Leap the yellow frog left onto the blue pole. Then, jump the white frog to the left onto the white pole. After that, hop the red frog to the right onto the red pole. Move the black frog right onto the black pole. Next, jump the green frog right onto the center pole. Move the yellow frog to the left onto the green pole. Leap the blue frog to the right onto the blue pole. Next, jump the yellow frog to the left onto the yellow pole. Finally, leap the green frog left onto the green pole. Puzzle #63 – Which Finger? Goal: Continuing in the order the puzzle gives, determine which finger the person in the puzzle would land on when they counted to 763. Solution: The large number is intended to throw you off. No matter how high the number, everything will increment in multiples of five because the order isn’t changing, so any number ending in 3 will be the same finger as 3 itself. The pinky is the correct solution. Puzzle #64 – Who Broke It? Goal: Determine which of the four people (A, B, C, or D) is lying. Solution: The puzzle says that the statements were given in order, and C’s statement is “D is lying,” before D has even had a chance to speak. C is lying, and C is the solution. Goal: Determine which shape doesn’t belong. Solution: Each shape is actually made up out of numbers. What makes one of them different is the number of times that number is used. The shape in the top-left is made up out of three threes. The middle is five fives, the top right is seven sevens, and the bottom right is four fours. The shape in the bottom left, however, is made up out of five sixes. That shape does not belong. Goal: Determine which of the three vases (A, B, or C) reminds the man of himself. Solution: The faces are a red herring. The shape of the vases are pretty unique, however, and if you flip A upside down, the profile created along its side is the exact profile of the man in question. A is the solution. Goal: Determine the fewest number of moves you can use to alternate the plain noodles and the pork noodles completely. Solution: By moving the bowl of plain noodles on the far left all the way to the right, you will create a perfect alternating pattern. This puzzle can be solved in one move, so your solution is one. Goal: Draw a cut along paper B that when unfolded, will match the cut in paper A when unfolded. Solution: Draw a diagonal line along the lower left-hand corner, from the dot two spaces up from the corner to the dot two spaces right from the corner. Puzzle #69 -Which One’s White? Goal: Which of the cats (A, B, C, D, or E) is white? Solution: If you pay close attention to the clues, you’ll realize they are referring to the cat’s names, which are not the same as their colors. Pay no attention to the colors in the images and follow the clues to determine that the green cat, C, is named White. The solution is C.
Goal: Determine whether the third youngest child in the family is a girl (A) or a boy (B) given the explanation. Solution: Actually, you can completely ignore most of the explanation. There are ten siblings, and you were told that Luke, who we know is a boy, is sibling number eight. The eighth sibling of ten would be the third youngest, so the entire rest of that complicated explanation exists only to confuse you. The third youngest sibling is a boy, so the answer to this puzzle is B. Goal: Determine which color paint was used the most to paint the wall with the weird symbols on it. Solution: The symbols are all strange enough shapes that it’s hard to tell which of them covers the most total areas without counting the individual bricks. Don’t forget about the white background, however, which definitely covers a bigger area that any of the five shapes. Tap the white paint can for your solution. Goal: Using the three colors of paint and never painting any two adjacent squares of paint the same color, determine which color will be used to paint place A. Solution: The only clue you have to go on is the one circle that’s already been painted red from there. Work outwards from there, and no matter how you paint the other circles, if you follow the rule that no adjacent circles can be the same color, circle A will always be red. Goal: Using the colors given to you and the tiles already in place, color in the rest of the wall so that the same color never appears twice in any horizontal, vertical, or diagonal line. Solution: The top row, from left to right, should be yellow, then blue, orange, and green. The row below that should be, from left to right, green, red, yellow, then blue. The third row should be blue, orange, then green, and red. The bottom row should be red, then yellow, then blue, and orange. That pattern satisfies the conditions. Goal: Find your way to the exit of the maze, sliding forward until you hit a wall each time you touch a banana peel. Solution: Move left four spaces to slide across the first banana peel. Then, backtrack two spaces to the right and move down one space to slide along the next banana peel. From there, backtrack two spaces up. Then, move five spaces to the right, two spaces up, two spaces left, one space up, three spaces left, one space down, two spaces left, one space up, and finally, one more space to the left to exit. The solution is shown to the right. Goal: Make a chick out of the pieces used to form Professor Layton’s Hat from the two earlier puzzles. Start by rotating the purple L-shaped piece 180 degrees and placing it on the bottom of the grid. Next, rotate the yellow piece 180 degrees and place it so it extends to the far right of the grid. Flip the blue piece and then rotate it 90 degrees clockwise before placing it to the left of the yellow piece. Rotate the red piece 90 degrees counter-clockwise and place it on the bottom of the remaining grid. Then, rotate the green piece 90 degrees and place it in the remaining space. Your solution should look like the image to the right. Goal: Given the conditions, determine the minimum number of people that could be seated around King Arthur’s Round Table? Solution: Five is the minimum number of people that fulfills all of the conditions given. Goal: Determine how many minutes earlier (or later) than his friend the man arrives, given the statements in the puzzle. Solution: He’ll arrive ten minutes early, and his friend will arrive ten minutes late, so overall he’ll be twenty minutes earlier than his friend. Goal: Determine the total number of hops the rabbit will need to take to reach a destination 10 meters away. Solution: It seems like the rabbit moves slowly because it always hops 30 centimeters back after every 70-centimeter hop, but it doesn’t actually say backwards in the puzzle. It says “the way his tail is facing,” so if the rabbit spins 180 degrees in mid-air with every hop, it can keep moving at a steady pace forward and reach the 10 meter mark in just 20 hops. The solution is 20. Goal: Determine which of the five swimmers (A, B, C, D, or E) is the fastest. Solution: Given the clues, the fastest swimmer out of all five of them is D.
Goal: Find the minimum number of people that could be present to complete scene described. Solution: The trick to this puzzle is that it never tells you the gender of the “child” mentioned. If the child is male, then both the child and one of the males described in the scene can actually be one and the same, requiring only one other female to complete the group. The solution is 3. Goal: Find the one number on the two dice that needs to be changed to be able to use the two dice to display every day of the calendar month. Solution: As usual, don’t forget that a 6 upside-down is a 9. That means the 9 on the first die can already serve as any 6 you would need. You do, however, need a zero on each die, so the 6 on the second die should be swapped out for a zero. The 6 on the second die is the number that needs to be changed. Goal: Identify which box (A, B, or C) could store the most grain. Solution: If you flip box A upside down, it has by far the greatest volume of all three. A is your solution. Goal: Shelve the books according to the conditions given. Solution: From left to right, your completed bookshelf should be the red book, then an empty space, then the yellow book, then the white book, and then the purple book. You may have noticed I left the blue book out. That’s because it lies sideways on top of the four remaining books, which is the trick to the puzzle. Goal: Determine how long it will take the four policemen to row across the river using only the one boat which seats 2 people. Solution: It will take them 6 minutes total going back and forth across the river to get all four policemen across. Goal: As with the last noodle soup puzzle, your task is to alternate plain noodles and pork noodles in the fewest number of moves. Solution: The trick here is that you don’t move any of the bowls of noodles at all. Pick up just the pork and not the bowl at all from the second last bowl to the right, and move it to the far-right bowl. In one move, the puzzle is complete, and so your solution to this one is 1, just like the last time. Goal: Get Luke and Professor Layton to the exit of the slide puzzle. Solution: The solution will follow one step at a time. Important pieces are labeled in the image to the right. Slide Luke and Layton (piece A) to the left one square. Slide the red piece (piece B) down one square. Then, drag the blue block (piece C) right two squares, down one square, and right one more square. Move the orange block (piece D) down one square and right two squares. Next, slide the green piece (piece E) three squares to the left. Slide D up one and right one. Drag E right one square, down two squares, and left one square. Then slide D left two spaces and up two spaces into the exit square. Move E right two spaces, up two spaces, and right one more space. Next, slide the yellow block (piece F) up one space and right two spaces. Drag A left one space and up two spaces. Move B three spaces left. Slide C two spaces down. Then, drag F right one square and down one square. Next, slide E left one, down two, and right one. Move piece D down two spaces and right two spaces. Finally, move piece A right one space, up two spaces, right one more space, and up two final spaces into the exit. Goal: Find the amount of allowance Sam would have to get weekly to make the statements given true. Solution: Sam doesn’t get an allowance. The solution is 0. Goal: Using the buy two and get the third at 50% off discount, determine how much of each item you would have to buy to spend 9.5 pounds total. Solution: Three one pound items, two of the two pound items, and one three pound item would cost exactly 9.5 pounds. Goal: Using the photograph of the race that’s been cut into pieces and shuffled, determine who came in third place. Solution: It’s tricky to re-assemble the pieces in your head and keep them all straight as you do, but if you can get the image together in your mind, F will be in third place. Goal: Identify which of the three shapes (A, B, or C) will form the dragon’s eye when folded. Solution: This is all about being able to visualize where the patterns will move to once they’re folded over. The solution is A. Goal: If the image on the left was flipped left-right and rotated an unknown amount to create the image on the right, determine which of the shapes in the image on the right has been changed. Solution: Shape G, if you flip it left-right, will not create the image shown on the right. Shape G does not belong, so that is your solution. Goal: Determine where to cut the board to form two identical shapes. Solution: Unlike the earlier puzzles to form squares out of pieces of wood, these shapes can be flipped once they’re cut. Start two squares to the right of the top left corner, and cut down two squares and right one square to make two identical boot-like shapes. Goal: Place mirrors in the grid to reflect light in the conditions given in the puzzle. Solution: Place the first mirror in the left-hand column second from the bottom, at a 45-degree angle facing upwards to the right. (Like a forward slash. / ) Place another mirror at the top of the second column facing the same way, and one mirror just underneath it, second from the top, facing the other direction, up to the left. (Like a backslash. \ ) Put the fourth mirror in the far right-hand column, second from the top, facing up to the left. Goal: Slide the bridge together to make it crossable and slide the dangerous-looking spiked ball out of the way. 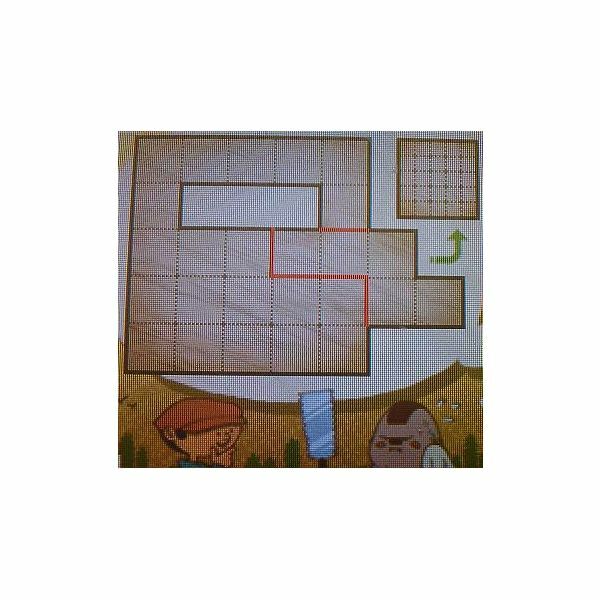 Solution: The solution is provided step-by-step, and as with earlier slide puzzles, the pieces will be labeled in the image to the right. Slide the T-shaped piece in the bottom left (piece A) right one square. Move the Z-shaped piece in the top left (piece B) down one square. Slide the L-shaped piece in the top right (piece C) down one square and left three squares. Next, slide the spiked ball (piece D) down one square, right one square, down one square, and right one more square. Move C right one square, up two squares, and right one more square. Then, drag A up two squares, left one square, up one square, and left one. Slide the L-shaped piece in the bottom right (piece E) left two squares and down one. Slide D left two squares and down one. Move C down one space, right one space, and down three spaces. Then, drag D up one space and right two spaces. Next, slide A right two spaces and up one space. Move B up one square, right one square, and up one square. Then, drag E up one space and left two spaces. Next, slide C left two spaces and down one space. Now, slide D down two squares. Move B down one space, right one space, and down one space. After that, drag A down one square and right one square. Slide E up two spaces, right one, up one, right one, and up one more. Finally, drag E one square to the left to finish putting the bridge back together. Goal: Determine which direction (A, B, C, or D) on the shape is up, if gravity is acting on the blocks. Solution: The only direction that could be up and still allow the blocks to hold the shape given without any of them falling is D.
Goal: Using the directions given for the shapes in the puzzle, choose the button you would have to start from to reach every square on the grid. Solution: You should notice pretty early on that no matter where you start, you always follow the same path to the same end point. It’s just a matter of working backwards after that to find the starting point, which is the star one square up and one square to the right from the bottom left corner. Goal: Find your way through the maze from beginning to end, only turning when you hit a wall. Solution: From the starting point, go down to the first wall, and turn right. Turn left towards the top of the screen at the next wall, and left again towards the left side at the next wall. Turn left once more to travel downwards, and turn right towards the left side of the screen at the next wall. At the next wall, turn right again to travel upwards, and right again at the next wall towards the right. Turn right once more to travel downwards, then right again to travel to the left side of the screen. Make a left turn at the next wall to travel downwards, and one last left turn to travel to the right, directly towards the exit. Goal: Navigate another maze that’s been littered with banana peels. Solution: Travel left one space, down two spaces, and left two spaces to step on your first banana peel. Move down one square from there onto the next banana, and then right three squares onto another banana. Backtrack three squares to the left from there and step up one square onto another banana. From here you can walk to the exit without any more banana peels. Move left two squares, down two, right two, down three, left two, up one, and left three more to reach the exit and solve this puzzle. The path is shown in the image to the right. Goal: Decipher the invitation to determine which door it’s referencing. Solution: The door on the bottom right is the solution to this one. Goal: Put the torn note back together to determine the secret number it contains. Solution: If you put the note back together, you’ll notice there aren’t any numbers on the actual paper that you can make out. There are some holes left in the center of the note when it’s assembled, however, that form the exact shape of the number “74.” The solution is 74. Goal: Plot paths between each couple that allows them to meet with each other without having to see anyone else along the way. Solution: From the girl A, move down five squares, right five squares, up four squares, and left one square to the boy A. From the girl B, move left one square, down four, right three squares, up two, and left one final square to the boy B. From the girl C, move left one square, down one square, left one square, down two, and right one to the boy C. Finally, from the girl D, go along the outer edge of the grid, down 6 squares and then left 6 squares to the boy D. That will give you a pattern with no crossing paths that you can submit as a solution. Goal: Determine which books you would have to buy to spend a total of 99 pounds. Solution: Four of the books add up to 99. The four you would have to buy would be the 27, 33, 15, and 24 pound books. 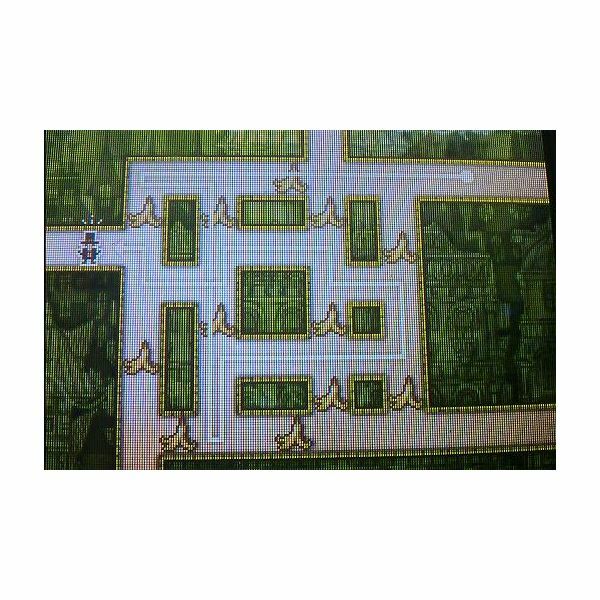 Stuck on a puzzle in the most recent entry in the Professor Layton series? These articles will walk you through the solution to every single puzzle in the game, including all of the available bonuses, and all of the weekly downloadable puzzles. Read on for all the answers you’ll need.